← Do you love to dance? By John G. Millett, J.D. The decision to divorce or experiencing a divorce or separation is one of the most emotional and trying times of a person’s life. It is not necessary to compound it with the added emotional stress and expense of the traditional legal process. My divorce mediation practice offers an alternative approach to judges, opposing lawyers, or other third parties who will decide your fate and the future of your family. I am not an online do-it-yourself website, nor am I a high-priced law firm. I complete the entire divorce process from beginning to end at a very reasonable cost and within the least amount of time possible. And my first consultation is free. I am a divorce survivor myself. After witnessing first-hand the emotional and wasteful process within the traditional legal system, ultimately, three grueling years later, we hired a mediator who finalized our divorce in a matter of hours. Mediation provided great relief in terms of eliminating the ongoing emotional stress and economic waste. Most importantly, it was in the best interest of our children. They no longer had to witness the strife and divisiveness created by the traditional adversarial legal process. Afterwards, I realized I wanted to dedicate my life to providing mediation services to other families. What is mediation? Although I am a lawyer, as a mediator, I am permitted to facilitate agreements between both parties. In mediation, it is not necessary nor is it required to have two lawyers representing each party. This is accomplished all within the scope of the law and the rules of the courts. In arbitration, or in a court setting, with a judge, that third party decides the outcome of your case. In mediation, on the other hand, all the decisions are made by the parties themselves. This is extremely empowering. I always explain to my clients that attorneys, courts, and judges are for parties who don’t agree. In mediation, the parties reach agreements and subsequently file the agreement with the court. Not the other way around. What if we can’t agree on anything? In mediation, when parties “hit a wall” and find it difficult or near impossible to agree, we call it an “impasse”. This can happen before, during, or after the mediation process. But there is always an answer, a solution, and an outcome. Assisted by both parties, I create thorough, balanced, and fair alternatives and options for each issue covered. The parties must keep in mind that, outside of mediation, the court will ultimately make the decision for you. Remember: there is always one issue everyone agrees on: the love we feel for our children. Therefore, it’s inaccurate to say “We can’t agree on anything.” The best interests of the children are the centerpiece and catalyst for reaching solutions and results. Even when couples do not have children, the respect toward one’s family is paramount. What is the process and how long does mediation take? I tell my clients we will begin with the basics and keep the process simple. It is extremely important to present and discuss all facts and to build trust between the parties and myself. This point is strongly emphasized. A divorce has three basic components: finances (assets and liabilities), support (child and spousal), and custody/visitation. A typical mediation requires approximately three or four 2-hour sessions. I must also complete other tasks outside the sessions, which takes another three to four hours. The entire process can be completed within a few weeks, assuming the clients’ schedules permit. When all issues are resolved, the agreement is formalized in a document that will be filed at the courthouse. The court will then issue a final divorce decree, and the process will be completed. Depending on the county, the time between the filing and final court order may vary, but usually it is no more than 60-90 days. Why mediation? Most people don’t know that, when Abraham Lincoln was practicing law, lawyers were referred to as “peacemakers”. He and other lawyers like him represented both parties in front of the court, and the goal was to reach an agreement in the most amicable and cost-efficient way possible. As time went on, legal disputes slowly began to involve two lawyers representing either party. And, rather than starting with what the parties agree upon, today’s courts spend a great deal of time and expense fighting over what the parties’ disagreements are—a very illogical process. Mediation examines what is possible rather than what is not possible, with clear benefits for all involved. 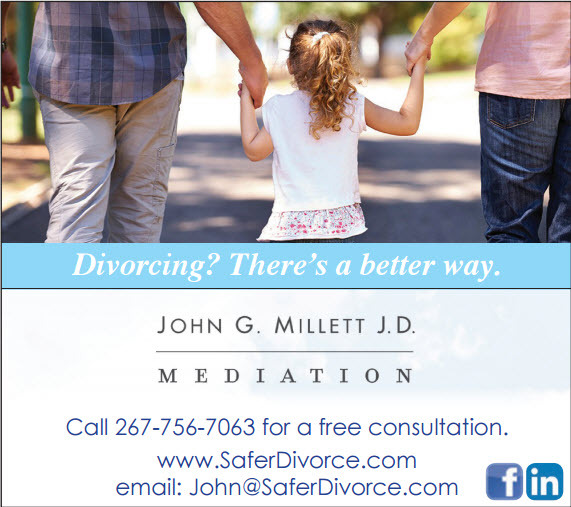 John Millett is a lawyer and small business owner. He earned his J.D. at Loyola University School of Law. John also received a B.A. With Honors from Rutgers University and an A.A. from Brookdale Community College. John has been a court- appointed R 1:40 mediator for 10 years and has mediated dozens of divorce cases as well as business disputes, both within the courts and through his private practice. 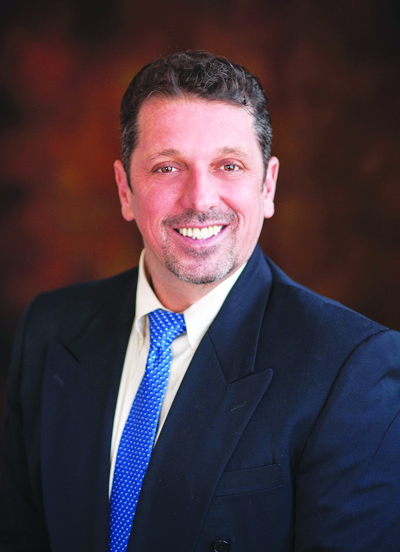 He is a member of the Pennsylvania Council of Mediators and the New Jersey Association of Professional Mediators and has experience as a mediator in government and for pro bono citizens’ groups. Become a distributor to the Bucks County Women’s Journal – the only educational newspaper serving the women of Bucks County! This entry was posted in Bucks County, Bucks County Local Paper, Divorce Mediation, Uncategorized, Women's Magazine, Women's Newspaper and tagged alternatives to divorce, divorce, divorce mediation, separation. Bookmark the permalink.